The Mountfield Princess 34 is an electric four-wheel rotary lawn mower suitable for small and medium sized gardens. It comes with an exceptional price and a range of features that make it the perfect tool for mowing lawns in small and medium sized gardens. Perhaps the most notable feature of the Mountfield Princess 34 is the motor. Sporting a powerful 1400 electric motor, the lawn mower has ample power for cutting lawns, even those that are in less than perfect condition. For instance, thick clumps of long grass can often be troublesome for smaller lawn mowers, but the Mountfield Princess 34 has no such issues thanks to its powerful motor. The motor makes the mower suitable for small and medium sized gardens, although it may take some time to mow in larger areas. However, a 15m electric cable does make manoeuvring in larger spaces that bit easier, so the Mountfield Princess 34 is certainly versatile enough to take on most common sized gardens in the UK. Despite the powerful motor, the Mountfield Princess 34 remains very lightweight. Weighing just 12kg, the lawn mower should be easy enough to operate, even for those that may struggle with a heavier machine. Expect to move it around the garden with ease, and there won’t be any concerns about getting tired from using it, as it is that easy to operate. This makes recommended for gardeners that otherwise struggle with fatigue or strains from using heavy lawn mowers. The Mountfield Princess 34 also features an impressive six cutting heights. This is perfect for cutting different grass conditions, whether its long, short, or somewhere in between, which is often necessary given the different growing rates for a lawn throughout the year. Heights are available from 25mm to 75mm, so you can easily get the precise cut you require for your lawn. This makes the mower very versatile as it can easily cut lawns of varying conditions over the year, whether it’s a well-maintained lawn or a lawn that’s become long and unkept. Better still, the Mountfield Princess 34 comes with a massive 35L grass collector. This makes mowing much less time consuming – especially on larger or longer lawns – as you don’t need to spend much time emptying it! Should you prefer, you can remove the grass collector as the Mountfield Princess 34 is also capable of mulching. Rather than collecting the grass, the mower instead directs all trimmings downward, resulting in a handy natural mulcher that leaves the lawn looking great! The Mountfield Princess 34 also comes with a great safety feature. Whenever you let go of the operating switch, the rotary blade stops spinning within 3 seconds, greatly reducing the risks of accidents when mowing. All in all, the Mountfield Princess 34 is a fantastic rotary lawn mower. 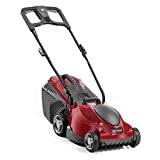 Providing plenty of cutting power for small and medium lawns, the lightweight lawn mower is easy to use and provides quality results, all of which is available for a great price!